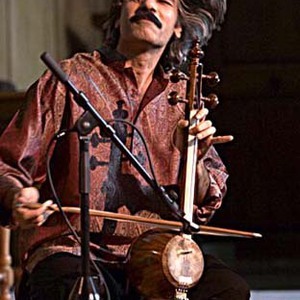 Kayhan Kalhor (Persian: ????? ???? ), born 1963, is an Iranian kamancheh player of Kurdish descent. Kayhan Kalhor was born in Tehran, Iran. He began studying music at seven years of age. By age thirteen he was playing in the National Orchestra of Radio and Television of Iran. Continuing his music studies under various teachers, he studied in the Persian radif tradition and also travelled to study in the northern part of Khorasan province, where music traditions have Kurdish and Turkic influences as well as Persian. At a musical conservatory in Tehran around age 20 Kalhor worked under the directorship of Mohammad Reza Lotfi who is from Northern Khorasan. Kalhor also travelled in the northwestern (Kurdish) provinces of Iran. He later moved to Rome and Ottawa to study European classical music. Kayhan Kalhor has a wide range of musical influences, he uses several musical instruments, and crosses cultural borders with his work, but at his center he is an intense player of the Persian violin. In his playing Kalhor often pins Persian classical music structures to the rich folk modes and melodies of the Kurdish tradition of Iran. Kalhor has composed works for, and played alongside, the famous Iranian vocalists Mohammad Reza Shajarian (see Masters of Persian Music) and Shahram Nazeri. He has also composed and performed with the Indian sitar player Shujaat Husain Khan, the two forming a ghazal group and publishing several albums. Kalhor's 2004 album Mirror of the Sky was a joint venture with the Kurdish Iranian lute player Ali akbar Moradi. Kalhor's most recent album The Wind (2006) is a collaboration with the Turkish baglama virtuoso Erdal Erzincan, with both Turkish and Persian pieces performed. At other times Kalhor has collaborated with Yo-Yo Ma's Silk Road Project Ensemble in the USA and the Kronos Quartet. Kalhor now resides in USA and has been commercially successful in USA over the past decade (two of his works were nominated for Grammy Awards in 2004).